The global regulatory affairs outsourcing market was valued at US$ 4,236.2 Mn in 2017 and is expected to expand at a CAGR of 13.1% from 2018 to 2026, according to a new report published by Transparency Market Research (TMR) titled “Regulatory Affairs Outsourcing Market – Global Industry Analysis, Size, Share, Growth, Trends, and Forecast, 2018–2026.” North America region is expected to hold the dominant revenue share, with the market in the region expanding at a CAGR of above 10%. The global regulatory affairs outsourcing market is mainly driven by growing stringent government regulations and automation in regulatory affairs. The pharmaceutical industry has been constantly evolving as traditional methods of drug development continue to expand. There is constant pressure on pharmaceutical and medical devices industry to reduce cost of prescription drugs and critical healthcare devices. As companies continue to expand their business in the global market, timely clinical approvals from regulators is becoming key to their success. Toward this end, biopharmaceutical and medical device companies have strengthened their in-house regulatory department or outsourced this function to regulatory affairs consulting firms. As pressure to improve return on investment grows, limitation on finding experienced workforce especially in smaller companies for internal R&D, and reduced drug development timeline with increasing stringent government regulations have led to the growth of the regulatory affairs market globally. 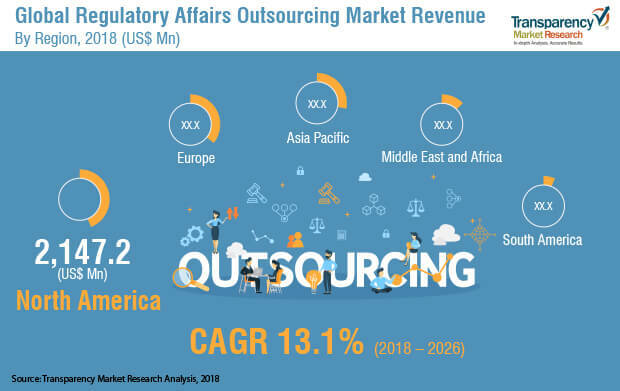 Also, increasing research and development activities, along with patent expirations, have been identified as major factors fueling the growth of the regulatory affairs outsourcing market. The regulatory affairs outsourcing market can be segmented based on service and region. The service segment is classified into regulatory submissions; clinical trial applications and product registrations; regulatory writing and publishing; regulatory consulting and legal representation;and others. The others segment includes maintenance and post-marketing surveillance. The growth in regulatory writing and publishing is attributed to the increased frequency of outsourcing medical writing, clinical trial summaries, drafting of informed consent forms and other services. Also, the regulatory consulting and legal representation segment is expected to expand at the highest CAGR during the forecast period. This is due to the increasing need for the consultation specifically with respect to country wise filing strategies and for gap analysis. Major players operating in the global regulatory affairs outsourcing market include PAREXEL International Corporation, WuXi AppTec, IQVIA Holdings Inc., Accell Clinical Research LLC, Clinilabs Inc., Criterium, Inc., Pharmaceutical Product Development, (PPD) LLC, Promedica International, Charles River Laboratories International, Inc., ICON plc., BlueReg Group, Covance, Inc., Dr. Regenold GmbH,FMD K&L, Genpact Limited, ProductLife S.A Group., Intertek Group plc, Kinapse Ltd, Medpace, Inc., Navitas Life Sciences, PharmaLex GmbH, PRA Health Sciences, Inc., Syneos Health, Inc., and Verisk 3E. These players are focusing on acquisitions and new strategic collaborations in order to increase their market share in the global regulatory affairs outsourcing market.